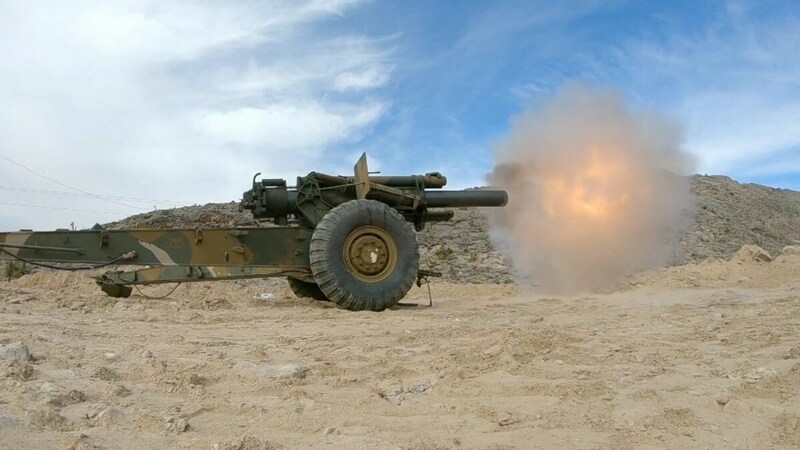 A classic artillery piece that was a staple of WWII, Korea and Vietnam, the M114 howitzer that Hamilton & Sons Firearms got working could be the largest caliber firing gun in civilian hands in the country. The M114 started life on the drawing board in the 1920s as the M1 howitzer to replace French-designed 155mm howitzers used during World War I. Put into production in 1942, more than 10,300 of the guns were built, remaining in U.S. service for decades. Weighing in at some 12,800-pounds, the 149.2-inch long barrel alone weighs almost 2 tons by itself. The gun fires 95-pound shells out to 16,000 yards through the use of two different bagged powder charges. Withdrawn and given to overseas allies or scrapped, artillery scholars hold that there are between 250 and 300 of these guns remaining around the country, but almost all are non-serviceable, relegated to VFW parking lots and museums with their breeches welded shut. Except, that is, for the one that Hamilton & Sons recently got working for Battlefield Vegas in Nevada, shown in action above. Big gun expert Bob Bigando, or Dangerous Bob, as he’s more commonly referred to in the firearms community, shows some of the loading and background work on the howitzer below. The Guns.com crew has previously hung out with Bigando as he got a 1943 British Ordnance QF 2-pounder back in action and followed him around the Big Sandy shoot and SHOT Show. On the downside, it costs $2495 to fire a single round through it.